Toggle switch is used to toggle the output between two devices. Means when one device is ON, second device remains OFF and when second device is OFF, first device becomes ON. This toggle of output can be controlled using a PUSH button switch, so you can control two devices using one button. Further you can interface two Relays in place of LEDs to control the two AC appliances. We have mainly used 555 time IC and 4017 IC in this circuit. 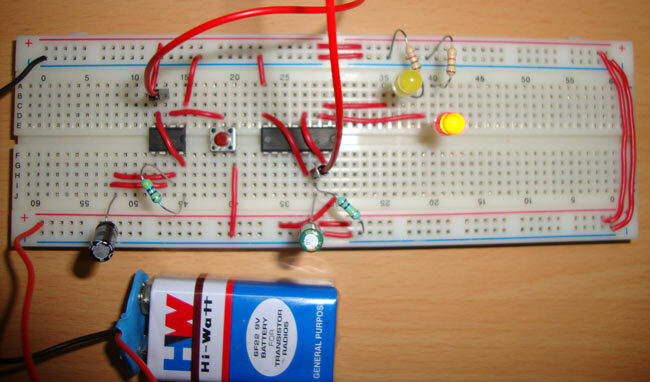 This same circuit can be used as PUSH ON/PUSH OFF button circuit, if we remove any of the LED. One button press would ON the LED and another Press would OFF the LED. We now know that 4017 IC output advance with a positive edge clock pulse, so we have used 555 timer IC in Monostable mode, to produce a LOW to HIGH clock pulse. We have connected a button on Trigger PIN 2 of 555 IC, to produce a positive edge pulse with each button press. To trigger the 555 in monostable mode, trigger PIN 2 must be LOW, so we have connected it to the Ground using PUSH button switch. This generated clock pulse at PIN 3 of 555 is given to 4017 IC at PIN 14. When firstly, power is applied to IC 4017, output at PIN 3 (Q0) is HIGH, where we have connected FIRST LED. When we press the PUSH button, then a LOW to HIGH clock pulse is applied to PIN 14 (first clock pulse) of 4017 and output at Q0 becomes low and PIN 2(Q1) becomes HIGH, where we have connected Second LED. Now this position will remain until the next clock pulse. If we press the Push Button again (second clock pulse), output at Q1 becomes LOW and Q2 becomes HIGH. And because Q2 is connected to the RESET pin 15 of 4017, it will reset the IC and again output at Q0 becomes HIGH (first LED) and Q2 becomes LOW (Second LED). So it works like a toggle switch. We have also used a RC circuit (22uf capacitor and 100k resistor) at CLOCK PIN 14 of 4017, so that it only counts one clock pulse on each time button is pressed. Otherwise circuit may behave unexpectedly OR it can count two or more pulses because of noise or bouncing effect of Push button. Could this circuit work with 10v - 14v dc? ... Could a 2nd 555 chip be used to control the 2nd half of the 4017? Check the datasheet for max voltage rating of the components used.